The International Journal of Emergency Medicine publishes selected prize-winning abstracts from various international meetings as a means to highlight ongoing international emergency medicine research. The following abstracts are from EMCON 2007, a biennial emergency medicine meeting held in India. This meeting was held at Sri Ramachandra Medical College & Research Institute, Chennai, in November 2007. 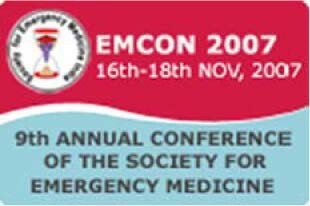 EMCON 2007 was organized by the Society for Emergency Medicine, India (SEMI) which was founded in 1999, with a view to promulgating high-quality emergency medicine in India. Over 75 abstracts were presented at this meeting; the Editors-in-Chief selected these abstracts for publication in International Journal of Emergency Medicine as representative highlights of the meeting. Background In severe head injury victims, apart from A, B and C care and decompression nothing else is promising. When we get a patient with myocardial infarct we decrease the demand by administering beta-blocker to limit the infarct size. We want to apply the same phenomenon to prevent secondary neurophysiologic damage to the brain. High-dose barbiturates appear to exert their cerebroprotective and ICP-lowering effects through several mechanisms: increasing cerebrovascular resistance, decreasing blood volume, decreasing cerebral metabolism, acting as a free oxygen radical scavenger. Aim Use of high-dose phenobarbitone (Gardenal) in head injury patients and checking the outcome by comparing with placebo. Material & method This prospective double-blinded randomized controlled trial was done in our emergency department. We included patients with severe head injury (GCS<8) aged above 18 years. Patients excluded from the study were the patients suspected to be under the influence of alcohol on presentation to the ER and those who had polytrauma. Drugs were prepared number-coded by a person who was not involved in the study. 100 ml NS was kept as a placebo and 100 ml of NS was prepared with 1 g of phenobarbitone and used as study sample. All patients with severe head injury were enrolled and received the pre-coded drugs. All patients were clinically observed. Results In study group 24 of 30 survived and in control group only 12 of 30 survived. The mean ventilator requirement was 9.2 days in study group and 14.6 in control group. The mean ICU stay was 12.6 days in study group and 19.6 in control group. Conclusion Single loading dose barbiturate in patients with head injury has good outcome, thus concluding that barbiturate coma has a role to play in head injury patients. Background Deliberate self-poisoning with yellow oleander seeds is common in Tamilnadu. Oleander poisoning results in severe toxicity in the heart and has a death rate of about 10%. Specialized treatment (such as temporary pacemakers and the use of antibodies) is expensive and not available in rural settings. Aim To investigate whether multi-dose activated charcoal could be a low-cost option for treating Oleander poisoning. Methods A prospective randomized double-blinded, placebo-controlled trial done in an emergency department of a university hospital. Patients who consumed oleander were included. Poly pharmacy and along with alcohol were excluded. Patients with Oleander poisoning received one dose of activated charcoal (standard treatment) and then randomly assigned either 50 g of activated charcoal four times a day for 3 days or a mixture of rice flour with a black cola drink (as a placebo). All other aspects of treatment were carried out as per Guidelines. Results 32 victims were involved during six month period 16 belonging to study group & remaining were in control group. There were no significant differences in demographic data, time of arrival & time to start treatment. 2 out of 16 had bradycardia in the study group (12.5%) and 6 out of 16 had bradycardia in the control group (37.5%). There were no deaths in the study group and 3 out of 16 died in the control group (18.75%). No one required pacing in the study group where as 4 required pacing in the control group (25%). All patients from the study group had been discharged home with in a weeks time and only 9 patients were discharged home in the control group (56.25%) and 4 required ICU stay upto 12 days (25%). Conclusion Multi-dose activated charcoal is safe and effective in reducing death and life-threatening cardiac arrhythmias after yellow oleander poisoning. Background I have been attracted by the department of Accident & Emergency Medicine and Critical Care (A&E). This department functions round the clock and never says no to any kind of emergencies. I have witnessed people surviving after cardiac arrest by effective resuscitation by the team. I have been taught about basic life support (BLS) by the A&E staff and I wanted to teach all others as it is not included in the MBBS curriculum. But before planning to teach I wanted to assess the present status of them. Aim To assess the knowledge of BLS among doctors, and students of medical, dental, and alternative medicine and nursing. Method This prospective study of the questionnaire type was done from July to September 2007. Twenty basic questions about BLS were asked in the questionnaire. Permission was obtained from the dean of our college and the questionnaire was distributed personally to the students and staff in two medical colleges, one dental college, one homeopathy and one nursing college. Papers were corrected using the key prepared from the ACLS manual. In total 1190 subjects were included in the study. Uncompleted forms were excluded from the study. Results Of the 1190 included subjects 410 were medical students, 100 were CRRIs, 60 were alternative medicine students, 67 were dental students, 86 were doctors, 37 were dentists, 400 were nursing students and 30 were nurses. 40% did not even know the correct abbreviation of BLS, 68% did not know the correct location of chest compression, 76% did not know the correct depth of chest compression and 72% did not know the ratio of chest compression. Conclusion Awareness of BLS is very poor among all the groups and the need for a BLS workshop is paramount for all medical and paramedical populations. Dr. Prasanth*, Prof. T.V. Ramakrishnan, Dr. Sathish R.
Objective To evaluate the reliability of bedside quantitative finger stick measurement of the principal ketone body 3-[beta]-hydroxybutyrate for the diagnosis of ketoacidosis. Methods This is a prospective study conducted in the Emergency Department from February 2007 to October 2007 in subjects who were >18 years presenting with hyperglycemia levels of 250 mg/l or greater in the Emergency Department setting with established diabetes. Subjects with gestational diabetes, with history of starvation and alcohol intake were excluded. Capillary beta hydroxybutyrate was measured in all patients at the time of admission and repeated after 4 h of insulin therapy. We studied the correlation of initial ketonemia measurement with the final diagnosis which was taken as a gold standard. The sensitivity, specificity and predictive value of ketonemia for the diagnosis of ketoacidosis were analyzed. Results We studied 145 hyperglycemic patients. The median time between arrival and finger stick testing of capillary ketone was 9 min. Out of 145 pts 67 were diagnosed as DKA (47%). In these subjects with a cut-off value for beta OHB of >1.6 mmol/l, 59 patients had elevated blood ketones. In 78 subjects diagnosed as non-DKA, 16 patients had elevated value of beta hydroxybutyrate. Analysis revealed sensitivity of 88% and specificity of 79% for the capillary beta hydroxybutyrate testing. Conclusion The measurement of 3-[beta]-hydroxybutyrate in capillary blood is faster, more effective, and is a reliable method for the diagnosis of ketoacidosis in the Emergency Department setting. Objectives To compare the accuracy of FAST (focused assessment sonography in trauma) scans done by emergency physicians and radiologists. To detect the reliability of FAST scans done by EM residents. To describe the presentation of patients requiring FAST scan in the ED. Methods This is an ongoing prospective study. A pilot study included 47 patients. All patients with a history of trauma in whom FAST scan was first performed by the emergency physician were included in the study. Exclusion criteria were ultrasound scans done in non-trauma patients, patients in whom FAST was not completed and patients who did not undergo a formal scan by the radiologist after the scan by the emergency physician. All the FAST scans were documented in a form as either positive, negative or indeterminate. A senior radiology registrar performed a formal scan on the same patient immediately and all patients were followed up during their hospital stay. Observations A total of 105 patients were included in the study from 15th June 2007 to 15th September 2007. 80% of the patients were males. The maximum number of patients were in the 20–30 year age group. 32% of patients had polytrauma, 19% had head injury, 14.3% of patients had isolated abdominal injuries, 11.4% had extremity injuries and 10.5% had chest injuries. 16 (15.23%) patients underwent surgery, 71 (67.6%) patients were managed conservatively and 18 (17.1%) patients were discharged against medical advice. 90 (85.7%) of the FAST scans were performed by junior residents in EM, 14 (13%) by senior residents and 3 (2.85%) by consultants. There were 19 scans and 79 scans which were correctly detected as positive & negative, respectively, by the emergency physicians. 3 patients were labelled as positive who were confirmed to be negative for free fluid. 4 (3.8%) patients labelled as negative by the emergency physicianwere detected to have free fluid during the radiologist’s scan. These 4 patients did not require any operative intervention. Sensitivity=82.6%, specificity=96.3%. Conclusions This study proves that FAST scans done by emergency physicians can be reliable, sensitive, highly specific and comparable to those by qualified radiologists. Ultrasound use must be encouraged in emergency departments to improve patient care.